This weekend my boyfriend and I ran the movie for University Productions. University Productions is a large organization on campus that has sub-committees that are dedicated to creating entertainment for Lehigh students. The committees are movies, music, comedy and arts & excursions. I’m the movie director this year, so I get to choose what movies come to campus. We show movies that are in between the theaters and DVD release. For music, we have two large concerts, one in the Fall before the Le-Laf game and one in the Spring. Throughout the year, there are smaller events such as battle of the bands. For arts &excursions, they go on trips to places such as NYC for Broadway shows, ski trips, and this year they went to a Giants vs Eagles game. For comedy, they have comedy shows throughout the year and they’ve had stand-up comedy down by students. It’s a great organization and all of the events are free to students, with the exception of arts and excursions. Students have to pay a small fee for the trips but they’re highly subsidized, so the trips are affordable. 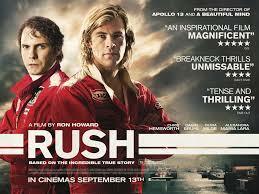 This weekend we showed Rush. I wasn’t too fond of it; I thought some parts were interesting and others boring. My boyfriend and the other guy we went with liked it though, so I wouldn’t take my opinion too seriously. We’re showing Cloudy With a Chance of Meatballs 2 next weekend and I’m more excited for that. This entry was posted in Uncategorized and tagged university productions. Bookmark the permalink.